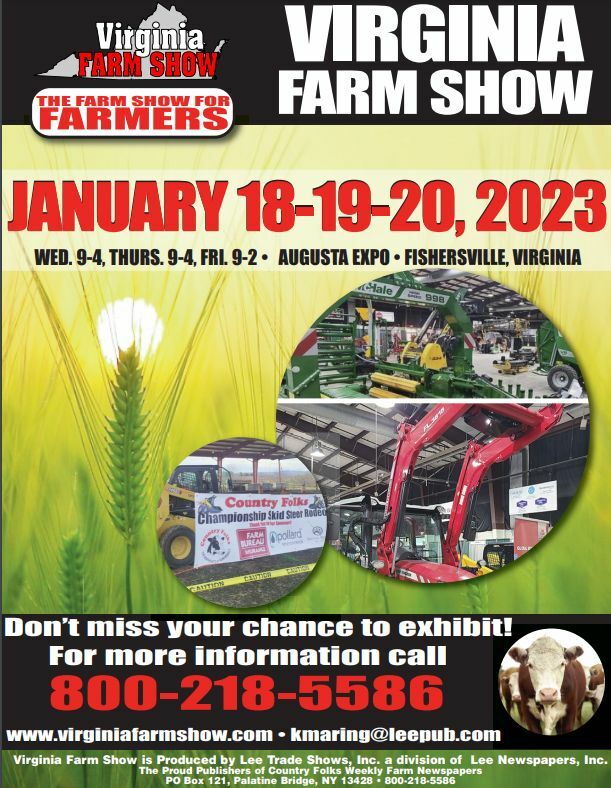 The Virginia Farm Show is the only agricultural trade show in Virginia that caters to full-time as well as the part-time farmer. In addition to exhibits of all the major lines of equipment and services there is a Skid Steer Rodeo for all the attendees to watch as well as participate in. The Diamond Level Sponsor of this event is the Virginia Farm Bureau. This event enables participants to compete for trophies and cash prizes for all major lines of skid steers. Originally organized by the Virginia Agribusiness Council in 1996, the show has doubled in size since Lee Publications, Inc. (publishers of the Farm Chronicle) took over management of the show in 1997. Attendees are a quality crowd of full-time and part-time farmers from Virginia, Maryland, Delaware and North Carolina. So please join us for the show to see equipment ranging from milking parlors to tractors and even portable sawmills!